embarrassing Snapshot of SpongeBob at the Krismas Party. I made this on photoshop myself, an Airbender4823 original of "the embarrassing snapshot of spongebob at the Krismas party". Wallpaper and background images in the Spongebob Squarepants club tagged: spongebob christmas. LOL the truth has been reviled ._. It's ok sponge!! I luv you, spongebob!!!! i think this is funny as in what patrick was laughin at with the box episode... "spongebobs embarrising photo from the christmas party"
hehehe, so cute, it would have been better if you actualy drawn the characters. Actually, this is not the real one. 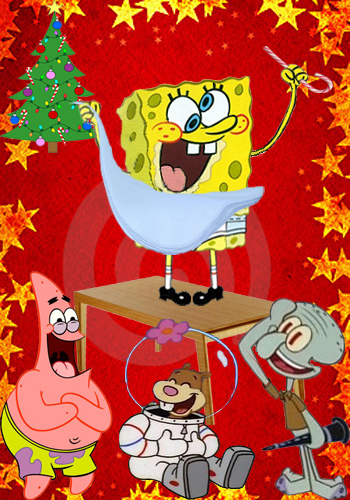 There was a short story where all the Nickelodeon cartoon came to a X-mas party where spongebob was dancing and his pants get ripped off at the back and someone took his picture. of course this isnt the real one but how cud ur verson be the real one if its based off of a short story?? Is it me or does SpongeBob look drunk?? he is drunk but how can you get drunk of eggnog in a... oh nevermind he drank too much now it leads to drunk! i cant believe this is his name going to eggbob drunkpants? I have saved this I have looked all over for this photo! HaHaHaHaHa! This is on my I POD TOUCH!